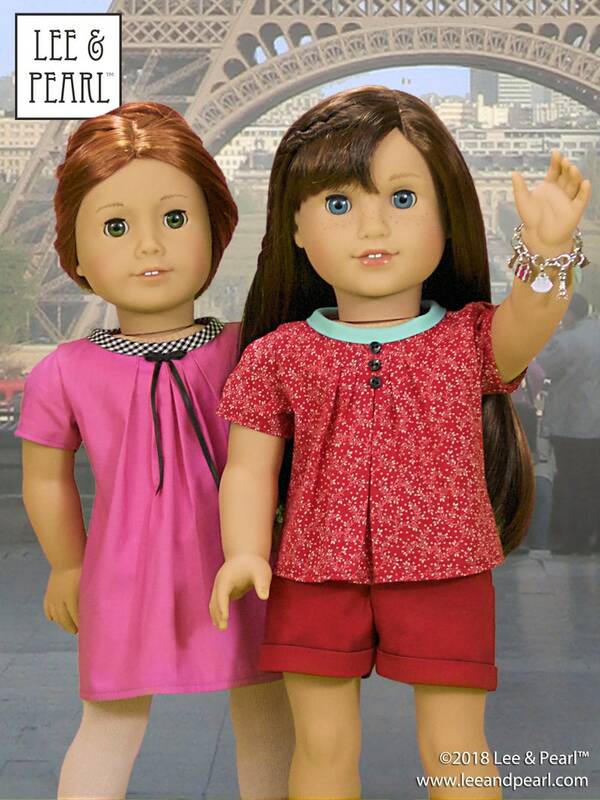 Inspired by the chic, retro-gamine styles seen in high-end French children's collections, our Bonjour, Paris TOP, DRESS, SHORTS and APRON fit perfectly into the closet of any doll who dreams of strolling boulevards, visiting morning markets, and enjoying a flaky pastry at a charming café. The classic TOP, which can also be made in DRESS length, features neatly stitched front pleats, inverted pleats on the tulip-shaped sleeves, and a ladylike rolled collar embellished with buttons, bows, ribbon flowers or anything else you choose. We've even included photo-illustrated directions to make your own PERFECT BOWS using a fork. The tailored, canvas-look SHORTS feature working hip pockets, optional cuffs and a front fly closure. 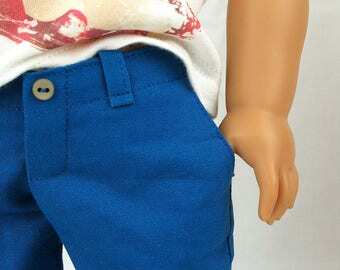 Best of all, our cleverly drafted waistband curves subtly higher in back than in front for a snug fit on your doll while she is standing — and a safe, no-gap fit when she sits. The perfect accessory for every 18" French chef or baker, our CHEF'S APRON features a flattering fit, generous double pocket and neat bias tape binding. We've also included directions to make your own bias binding out of ordinary woven fabric. The top, dress and shorts in this pattern are rated EASY/INTERMEDIATE for the pleats and a few curved seams. The chef's apron is rated EASY, though the bias tape binding application should be performed with care. As an added bonus, we've included a pattern piece for making a super-quick EASY version of our wonderful shorts without pockets. As always, Lee & Pearl's photo-illustrated directions and computer-drafted, guaranteed-to-fit-together pattern pieces make every step as easy as possible. The garments in this pattern use easy-to-sew fabric you probably already have on hand: ordinary woven fabrics like medium weight quilting cotton or Kona® cotton for the shorts and apron, and shirtings, voile, gingham or lightweight quilting cotton for the top and dress. Sign up for our mailing list at www.leeandpearl.com, and you'll receive our newsletter full of free pattern tweaks, tutorials, crafts and printables. PLUS, you'll get the link for our annual members-only FREE PATTERN. 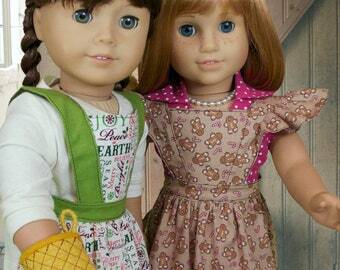 Starting in December 2018, that's Lee & Pearl Pattern 1038: The Gift Bow Front Dress for 18 Inch, 16 Inch and 14 1/2 Inch Dolls. While scouting the fashion pages and runway reports for inspiration, our pattern designer was struck by one of the prettiest trends we’ve seen in a long time. You’ve probably noticed it too — all those soft ruffles and gathers, interesting pleats and seams, bows and motifs formed out of the fabric of the dress itself. It’s an organic kind of ornamentation, that allows over-the-top frills while still retaining the elegant restraint of a vintage couture gown. Our Bow Front Dress explores this lovely trend with pleated raglan sleeves, a draped front panel and inverted center front pleats that mimic the look of a tied ribbon bow. Best of all, we designed this dress to be made from a single quarter yard or fat quarter of ordinary woven fabric — a dress designed around the use of pretty fabrics should allow you to use a wide variety of pretty fabrics! 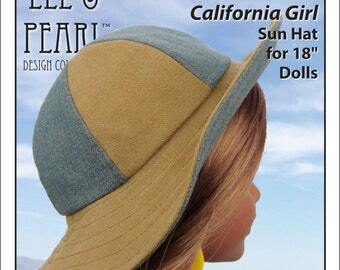 Do not miss out on this pattern — join our mailing list today at www.leeandpearl.com. Join the Lee & Pearl™ community: like us on Facebook (Lee & Pearl), follow us on Instagram (#leeandpearl), share us on Pinterest (www.pinterest.com/leeandpearl) and watch us on YouTube (https://www.youtube.com/c/leeandpearl). This pattern will be delivered as an instant download. After purchasing, you will receive a link to a PDF copy of the file. No paper copy will be mailed. This pattern may be printed solely by the original purchaser. It may not be duplicated, redistributed, posted or resold without prior authorization from Lee & Pearl™. If you use this pattern to make items to sell yourself, we ask that you give Lee & Pearl™ design credit in the description of those items. Thank you! 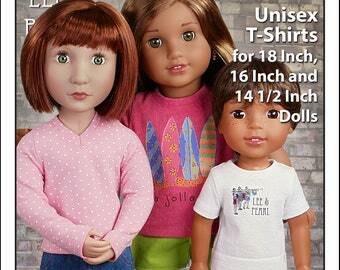 Lee & Pearl™ is not affiliated with Mattel, American Girl® or any other company or organization. L&P #1058: Retro Ruffled Swimsuit and High Waisted Bikini Pattern for 18 inch dolls — the cutest little vintage-style swimsuit! 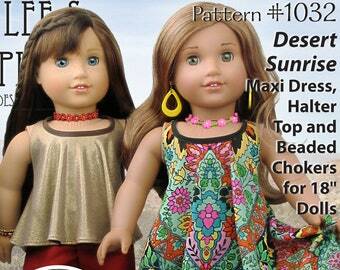 L&P #1057: Halter Swimsuit with Tiered Drape and Halter Swimdress Pattern for 18 inch dolls — flattering, trendy and easy-to-make! 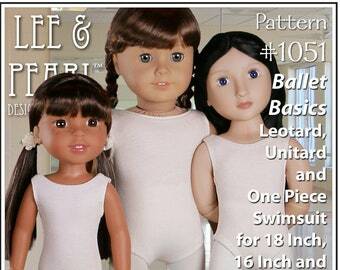 L&P #1075: Ballet Slippers Pattern for 18 Inch, 16 Inch and 14 1/2 Inch Dolls — ultra-realistic dance shoes that are easy to make too! The apron pattern is sweet. Love the detailing on it and the top. Always enjoy L & P 18" doll patterns, directions are easy to follow and I am never disappointed with the detail put into these fashion designs!